My palate has grown up since that summer oh so many years ago, and I have to say pesto is now one of my most favorite ways to dress up any meal. Seriously. It’s like the little black dress of condiments…Little green dress. You thought salmon wrapped in puff pastry was good? Try spreading some pesto on the salmon before wrapping it up, and you can now charge your guests $10 more per plate. A spoonful of pesto will make your Minestrone soup sing. 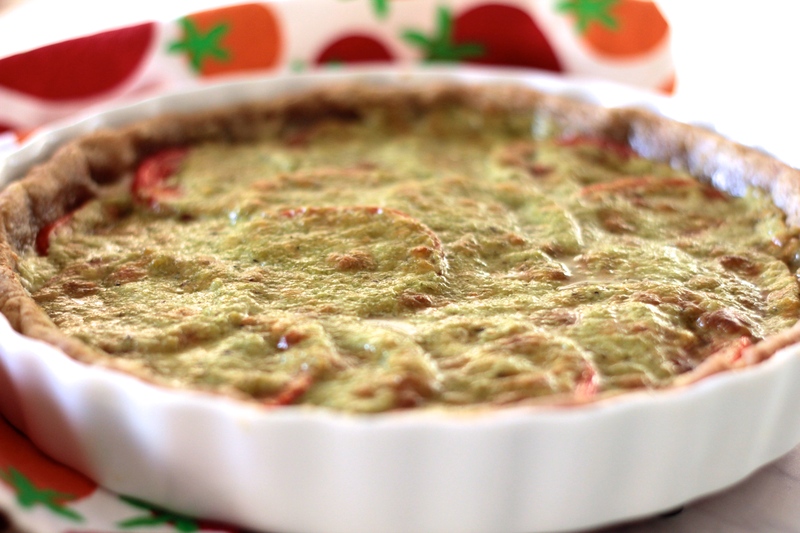 Put a little green dress on a tomato tart, and you will instantly become the belle of the ball. 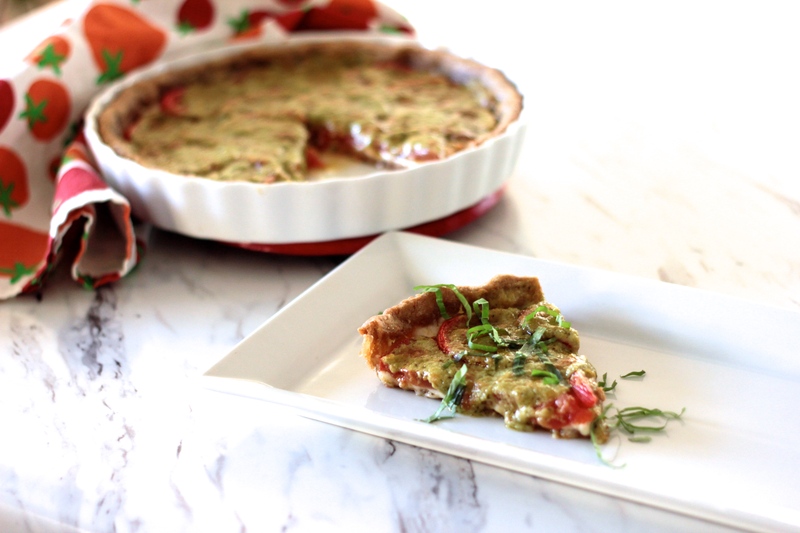 I have brought this Tomato Pesto Tart to numerous get-togethers and brunches, and it has always disappeared within the first 60 seconds, and I have had to recite the recipe from memory to countless tomato-pesto-tart-wanna-be-makers. And now, the secret is yours! 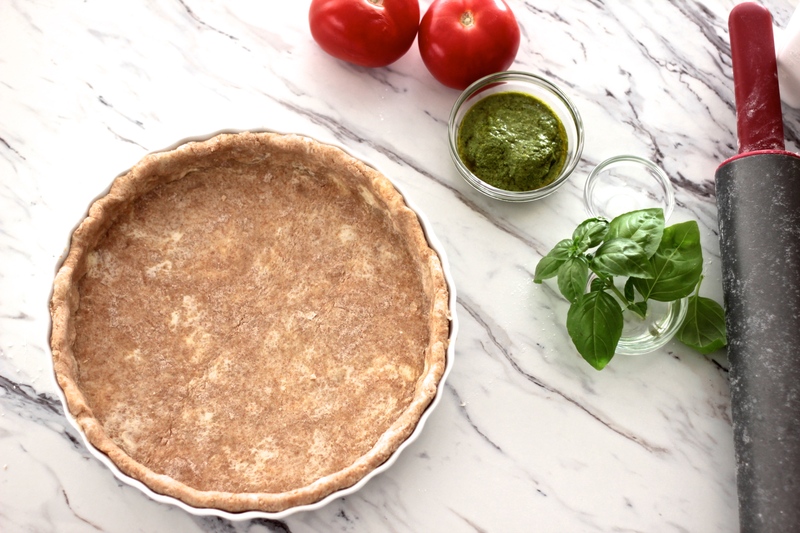 The key to a flaky whole wheat pie crust is keeping your refrigerated fats cold and your ice water ice cold. When you use your hands to pull the pie dough together, you are going to knead it just enough, so the heat from your hands doesn’t heat up the butter and shortening. You want to see “butter lumps” like this in your dough, then you know it’ll be extra flaky and crispy for your tart. Gently fit it into your tart pan and get it ready to blind bake. You can use a tart pan with the removable bottom, but I wanted to use this white porcelain one (mainly for aesthetic purposes). 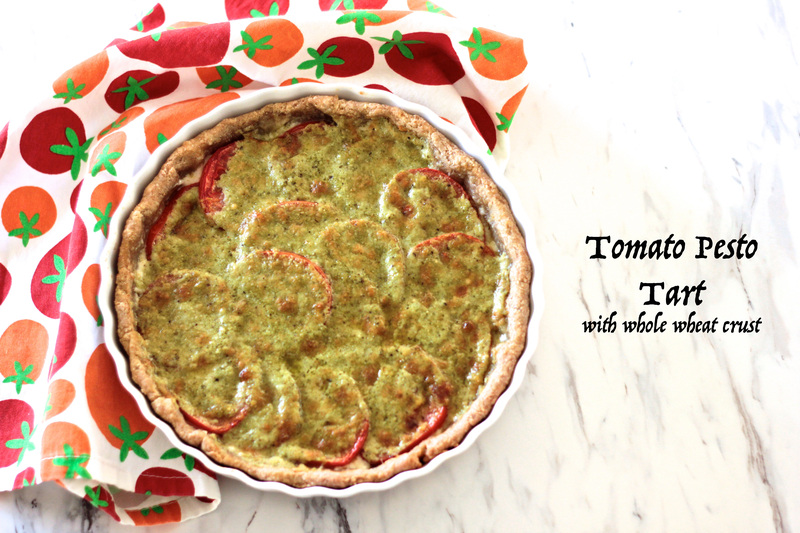 While your tart shell is blind baking, just whip up the rest of your ingredients–fresh garden tomatoes, your favorite pesto, fontina cheese, a little plain yogurt (or sour cream, or vegan mayonnaise) and then bake again until it all gets melty and your kitchen smells like a small corner of Italy. Serve with a little side salad and your dinner will be of the amazing-rave-to-all-your-neighbors sort. Start with the pie crust. Place flours, salt, and sugar in a large bowl and mix well. Dice the cold butter and add with the shortening to the flour mix. Cut in with a pastry cutter until pea-size. Add 4 tablespoons of ice water to the dough and stir with a spoon until it starts to stick together. Add 4-6 more tablespoons until most of the dough is a ball. Dump out on a floured surface and knead just until the dough forms into a ball. Flatten into a disc, wrap in wax paper, and refrigerate for at least 20 minutes. Preheat the oven to 425. 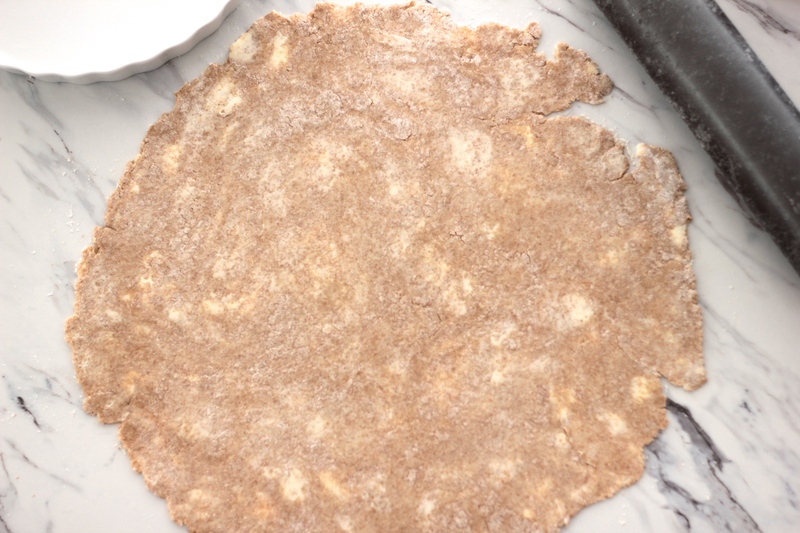 Roll out the pie dough on a floured surface into a 12-inch circle. Fit the dough into an 8-10 inch tart pan and prick the bottom with a fork. 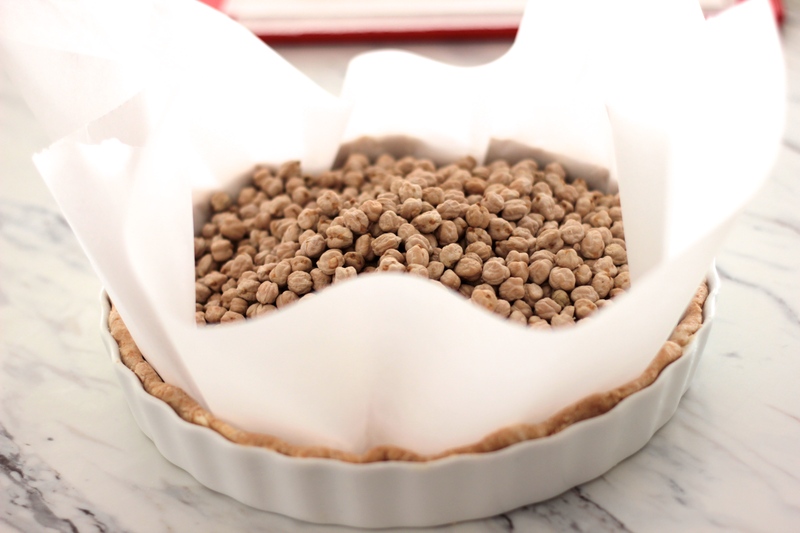 Fit a large piece of parchment paper into the pie shell and fill with beans or pie weights. Blind bake for 8-10 minutes. Meanwhile, slice the tomatoes and let rest on a paper towel to absorb extra liquid. Stir together half of the shredded fontina cheese, yogurt, parmesan cheese, pesto and pepper. 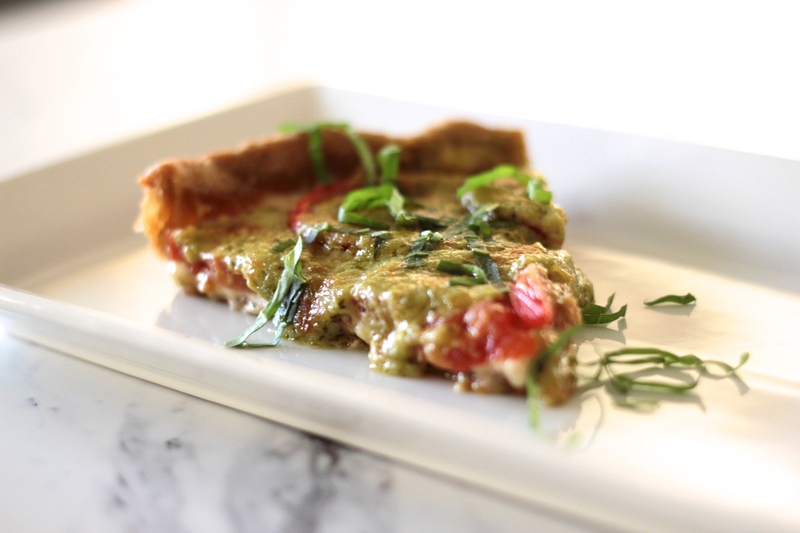 When the tart shell is done baking, sprinkle with the remaining shredded fontina cheese and let stand for 10-15 minutes, until the cheese is melted. 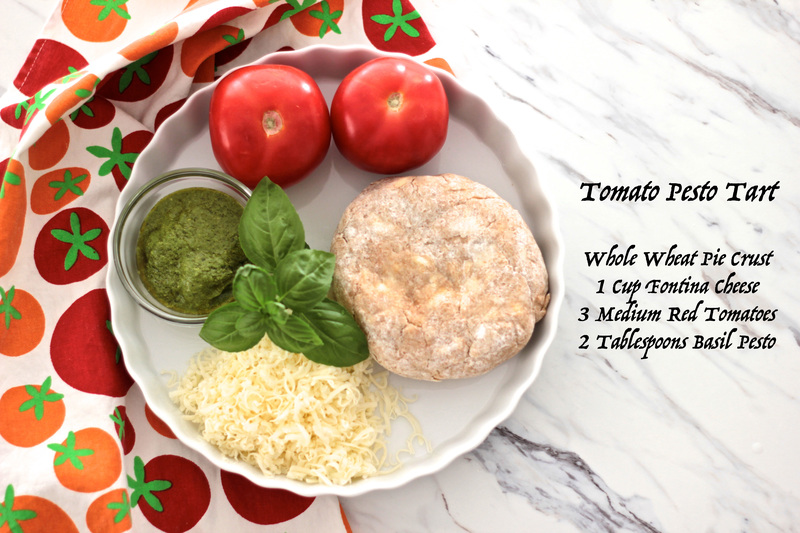 Arrange the tomato slices over the cheese. 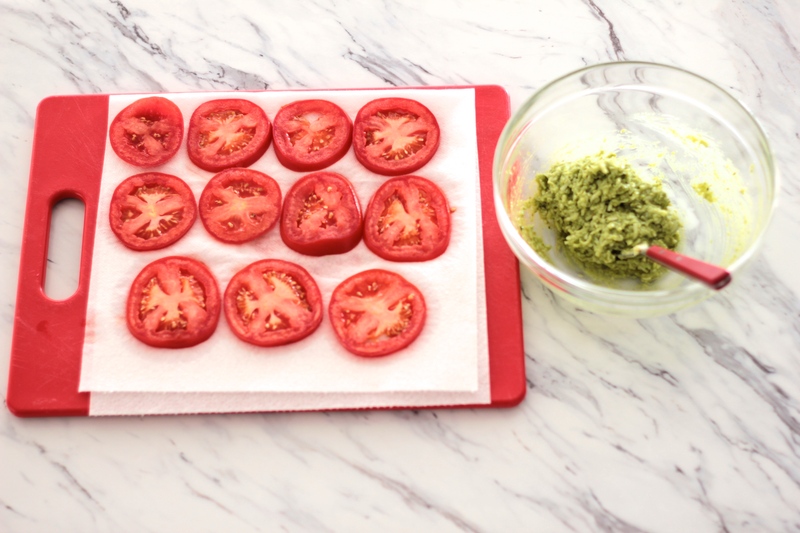 Spread the pesto yogurt cheese mixture over the tomato slices, leaving a 1″ border around the edge. Bake at 375 for 20-25 minutes, until the cheese is golden. Remove from the oven and let cool. Sprinkle with fresh basil before serving.